Increasing employee satisfaction is essential in helping boost business productivity and success. However, tracking employee satisfaction can be a challenge in any organization. Orion Advisor Services, LLC (Orion), a wholly owned subsidiary of NorthStar Financial Services Group, is America’s largest privately held portfolio management technology platform. Each day, a team of over 360 employees focus their efforts on developing technology to help financial advisory professionals work more efficiently, better connect with their clients, and enjoy their business again. But Orion founder and CEO Eric Clarke wanted each member of the team to be as satisfied with their career as the advisors they work so hard to support. And, because so much of Orion’s success had been built on a culture and reputation for innovation and service excellence, it was particularly important that employees remain engaged. Before SnapComms, Orion had been taking a quarterly net promoter score from employees. But with an approximate 80% response rate, the HR team felt there was room for improvement. Quarterly wasn’t regular enough to capture an accurate picture. Did a bad score mean one bad day? Or was it an entire bad quarter? Management worried they could be missing crucial information. They needed to identify the leading indicators of employee engagement to improve the overall employee experience and convert the majority of employees into Orion promoters. Gathering that data regularly in a non-invasive way posed the greatest challenge. As a result, the need for a direct feedback channel between employees and senior leadership became clear, and the idea for the Daily Pulse survey was born. Orion looked deeper into how they could make the Daily Pulse survey a reality. “I envisioned a daily survey that would be simple and fast, and I wanted it to use technology,” shares Clarke. Being a software development company that prides itself on its commitment to innovation, the delivery method for this daily survey needed to be strategic: No email (because staff could easily miss it), no link to an external site (because staff could easily fail to complete it), and it must be millennial-approved. After a short trial, Orion introduced the SnapComms employee survey channel, a pop-up alert that typically appears in the bottom right hand of a screen, and an effective tool for soliciting actionable data for management. 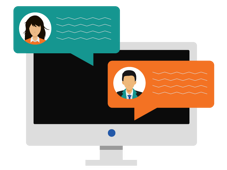 Though used by Orion to ask one clear question every day, the survey tool does have a flexible design meaning there are no restrictions on the number of questions asked, and a variety of question types are available. Orion uses the SnapComms surveys for two purposes. 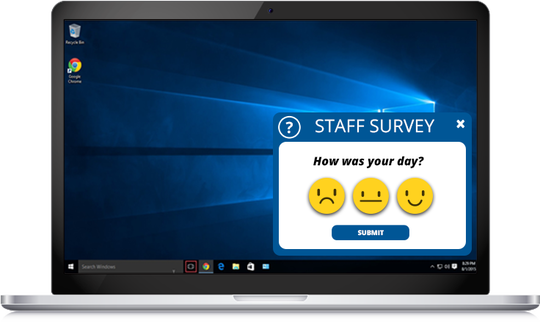 The first is the Daily Pulse, “How was your day?” survey, which prompts staff to select either a good, neutral or bad emoji. The second is the quarterly Employee Net Promoter Score ranking, where staff are asked how likely they are to recommend working at Orion based on a scale of 1 – 10. Every employee is surveyed, from entry level to executive. The surveys are sent at the same time each day but are staggered across different shifts. The surveys are not anonymized, so the data can be linked directly back to individual employees. Data is compiled and analyzed monthly, with a summary relayed back to management. Managers can see results for all their direct reports, providing thorough insight into their team and the company. Use of the SnapComms surveys for the Daily Pulse initiative has equipped Orion with the employee experience data it wanted. On average, more than 90% of employees complete the Daily Pulse. This substantial data set enables the HR team to identify any trends, such as stressful periods within the organization or if certain departments are happier (or less so) than others. Additionally, response rates for the monthly employee Net Promoter Score have leapt from 80% (before SnapComms) to 93% (after SnapComms). The tool has also helped management address and improve negative indicators of employee satisfaction. “It’s been a learning curve. Everyone has a different definition of what constitutes a good day, but it’s given us the ability to identify the staff at risk and do something before it’s too late. We’ve been able to provide that actionable data and coach our managers on how to support employees who need it,” explains Lane. Perhaps most important to the long-term health of the culture, the Daily Pulse initiative has become a catalyst for conversation, where managers are encouraged to interact with their staff about their experiences. This has absolutely changed the dialogue we are having with our employees. It’s given us the ability to identify the staff at risk, and do something before it’s too late.